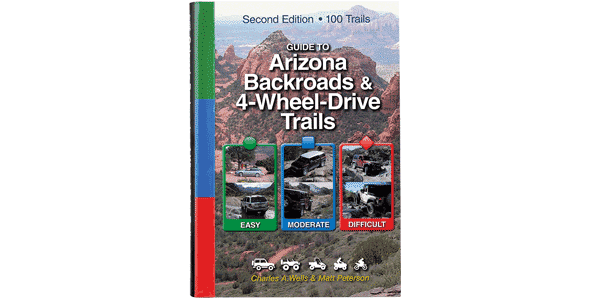 Accesses large network of narrow, steep OHV trails. This route accesses a vast network of great OHV trails. You can ride for days, but it’s very easy to get lost. Follow these directions carefully until you become familiar with the area. A fantastic place for ATVs, UTVs and dirt bikes. Those looking for extreme challenge can attempt to get through the rocky canyon east of “Squeeze Rock.” If you do any shooting, please pack out everything. Don’t add to the ugly mess already there. Cleanups are planned. Although most of the route is easy to moderate, the northern loop is extremely steep and narrow. Be very careful as ruts and washouts are constantly changing. Turn around if necessary. Modified vehicles are best, but a skilled driver can do this trail in an aggressive stock high clearance SUV. The early part and last part is really disappointing with all the trash left by shooters. Not particularly scenic either. However, the red part is quite worthwhile. Running clockwise, the first portion has an obstacle that is very difficult even with 37’s and 4″ lift. We high centered but managed to pull thru. beyond that, it was a blast. The portion noted in the book with washouts is a bit tricky but the correct trail becomes apparent. Highly recommend.